Is anyone else watching March Madness? I am part of a March Madness pool this year and it is definitely bringing out my obsessive, must-win, personality. I have never cared so much about basketball. Although I do find it more entertaining than NBA. I find there is more obvious strategizing and playmaking as opposed to just running from one end to the other and scoring every time. This vanilla mousse is obviously a win-win situation. 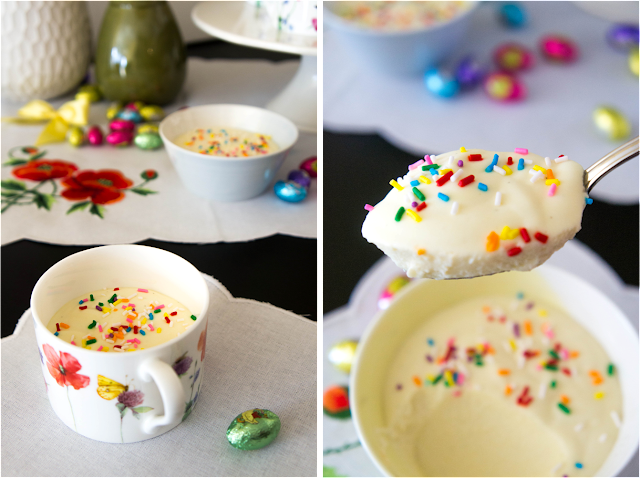 Creamy, airy, vanilla mousse. Colourful rainbow sprinkles. Win win. 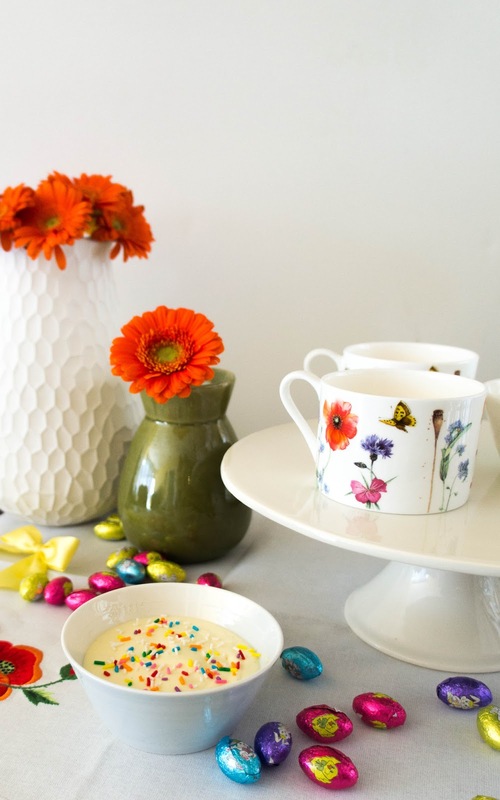 There is something about Easter and spring that makes me think vanilla. Chocolate brings to mind cozy winter evenings. Vanilla is warm-weather flavour. 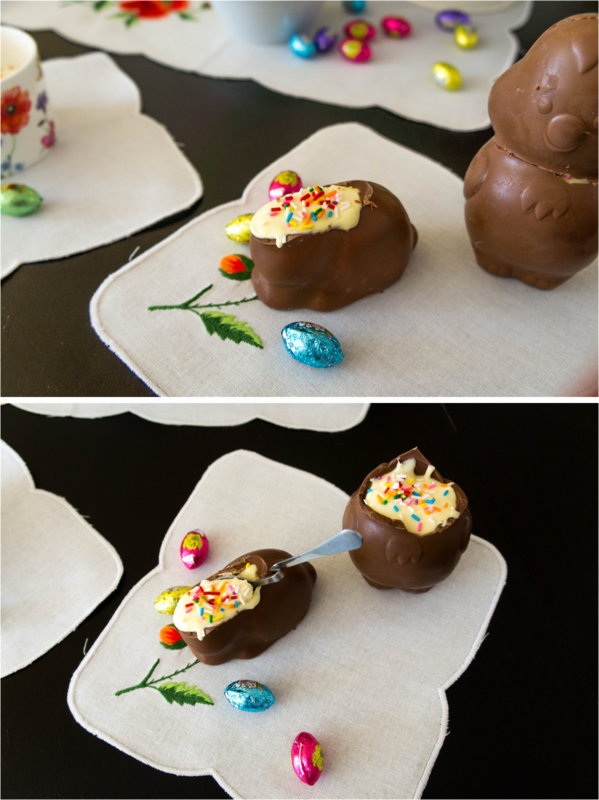 Which is funny because we eat all this chocolate for Easter right? Maybe this is just me. Either way, vanilla is delicious and rainbow sprinkles are super fun! 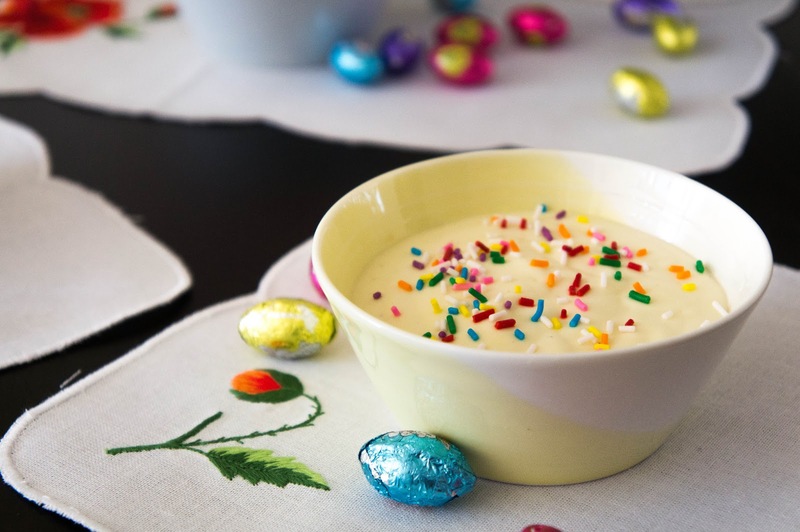 This vanilla mousse is made almost like a custard ice-cream base. And it tastes like vanilla ice cream too. But fluffier. Serving up this mousse in chocolate cups would be elegant. My version of serving it in chocolate Easter chickens and bunnies is less elegant, but results in the same outcome, and it was kinda fun doing it. This mousse makes me feel like spring is coming for real and not just on the calendar. Rainbow sprinkles of your choice! 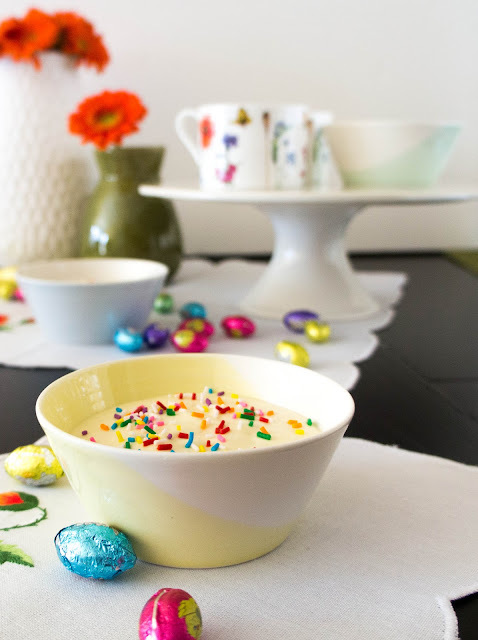 Sprinkle gelatine onto water in a small bowl and set aside while you make the mousse. Prepare an ice bath by filling a large bowl with cold water and ice cubes. Prepare beside the ice bath another clean bowl that will fit inside the ice bath bowl and a strainer. This is so you’re not rushing to do this when your custard is done. Let’s be prepared! Scrape the seeds out of the vanilla bean and place along with the vanilla pod (or just vanilla extract) into the milk in a medium saucepan. Heat over medium heat until it begins to simmer. While the milk is heating, whisk egg yolks and sugar in another bowl until combined and the yolks begin to pale a little. You don’t have to go crazy here. Once the milk is just simmering, pour the hot milk into the egg yolks, whisking constantly so that they don’t curdle. Pour the mixture back into the saucepan, turn heat to low, and cook, stirring constantly, until the mixture thickens enough to coat the back of a spoon. This is when you can dip a spoon into the custard and draw a line with your finger on the back of a spoon, and the two sides of the line stay apart and do not flow back together. Remove from heat, add gelatine (which should be quite thick in the water now), and whisk until completely dissolved. It shouldn’t take long. Strain into the clean bowl you prepared earlier and place in ice bath. Stir constantly until the mixture cools, thickens, and begins to set. You want a pudding like consistency. Once thickened, quickly whip cream to soft peaks and fold into the pudding-like custard base gently. Spoon into dessert cups or bowls and refrigerate until set. Approximately 2 hours. Just before serving, top with rainbow sprinkles! How many servings do you get from this recipe? Thanks! Mariana, I got about 6 of the bowls pictured. They were pretty large servings though, so I would probably say 6-8. Enjoy!